With Oracle Service Bus PS6 or 11.1.1.7 we finally have an new offline build tool with does not require Eclipse (OEPE). With this OSB configjar tool ( located in the OSB home /tools/configjar/ folder ) you can make OSB export sbconfig jar based on 1 or more OSB projects or even with more then one OSB Configuration projects. Plus have total control what to include or exclude. In this blogpost I will show you first, how to do this in a shell script with I run on a linux server and the second part how to do the same with maven. all demo code is available at github and contains a demo OSB workspace. Next step is to use this setting xml in our shell script. That's all, this will generate the sbconfig jars but we can also do the same with maven. The rest of the blog will describe the maven build and deploy. 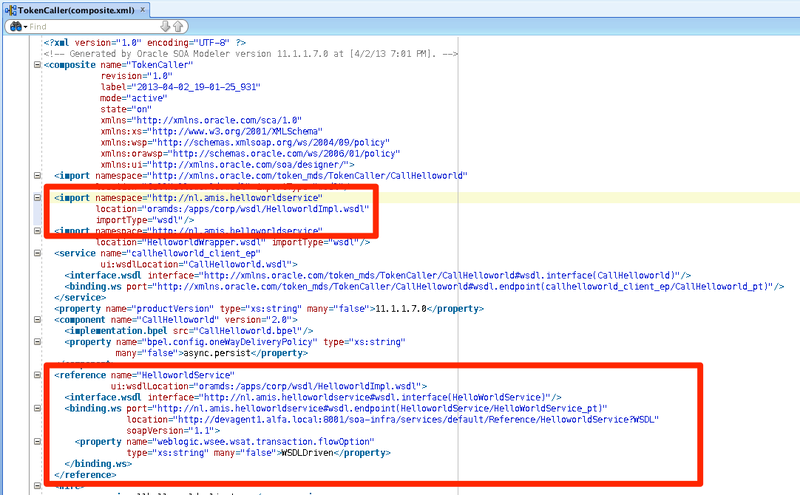 First we also need to have a setting xml which will be used by maven. The OSB setting file does not support environment variables so I need to use the com.google.code.maven-replacer-plugin maven plugin to replace the tokens. The OSB project pom ( located in the OSB project folder) , this one is level deeper then the workspace pom. Here is the parent pom with the prepare package phase to replace the tokens in the osb setting file, package for making a sbconfig jar and the deploy phase which use the WLST import.py script to deploy it to the server. At last we can generate some artifacts. 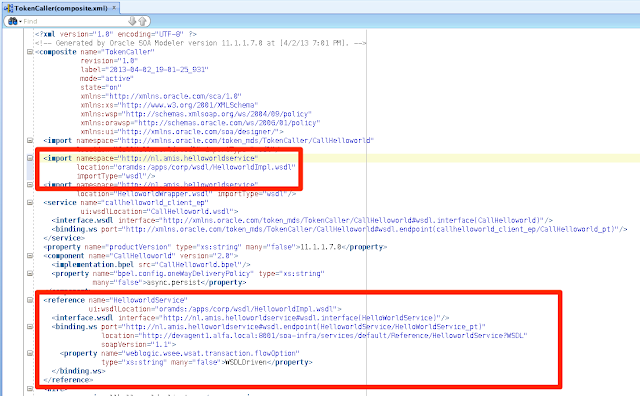 Important to know this only works on the location attribute of the binding.ws element of the composite.xml file. But when you use Metadata Service (MDS) and call a Web Service like a Java WS, .Net WS, OSB or SOA Suite Reference Services then you can use this new feature. In this blogpost I will show you all the steps. In this demo I created a workspace with a MDS project which contains some WSDL's with a XML Schema. This WSDL is used in the Helloworld Reference Soa project. Deployed it together with the MDS soa sar and I put the Impl of the Reference WSDL back to the MDS so it can be used in my other main project ( I downloaded it from the EM and changed the xml schema import ). 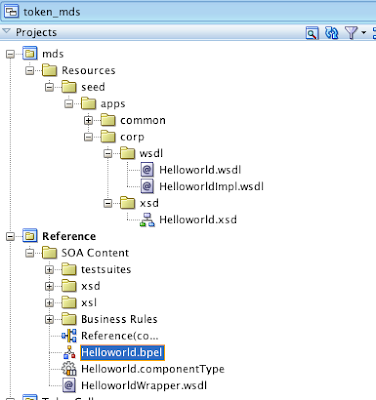 The main project will call this helloworld reference service and in this project we will use a server name token in the WSDL url ( location attribute of the binding.ws element ). 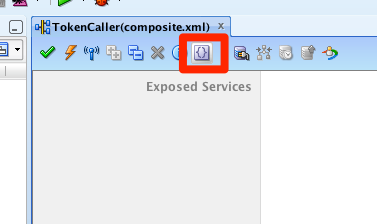 After adding the reference service, we need to fix some hard references in the composite.xml to this remote service. Do the same for ui:wsdlLocation attribute of the Reference element. In the location attribute of the Binding.WS element we need to use the real reference WSDL url ( see the EM for the reference WSDL url ). Now our main Soa Suite project only needs this reference service at runtime and we won't have any deployment issues or invalid composites after a reboot of the Soa Suite Service. Click the token button of the composite.xml editor. Select our reference service and click on edit. 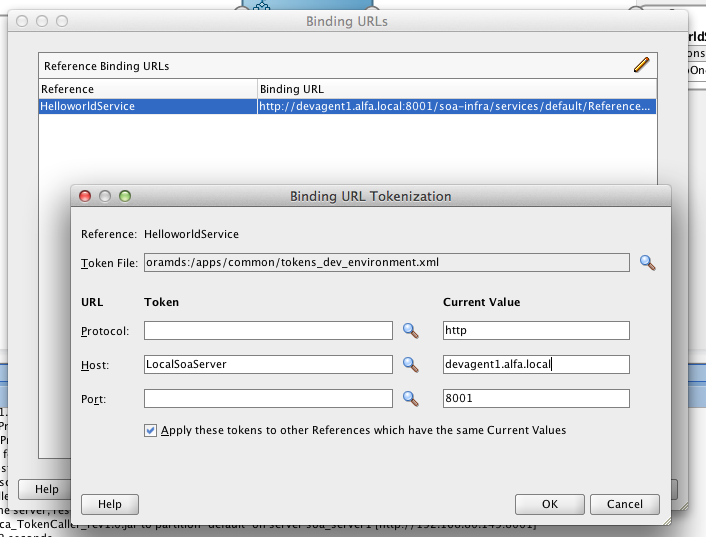 Lookup the just created Token file and on the Host field we can lookup our LocalSoaServer entry. We are ready to compile the project. 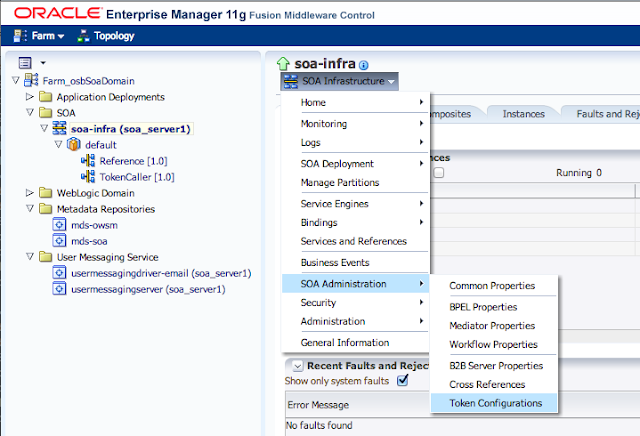 The Soa Suite server does not know this LocalSoaServer token so we need to create this token in the Enterprise Manager. 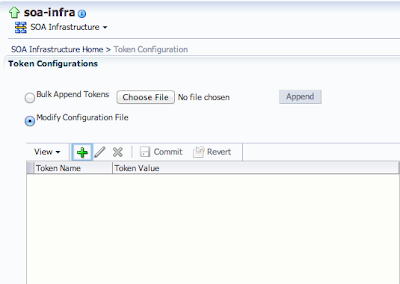 Go to SOA Infrastructure -> SOA Administration -> Token Configurations. 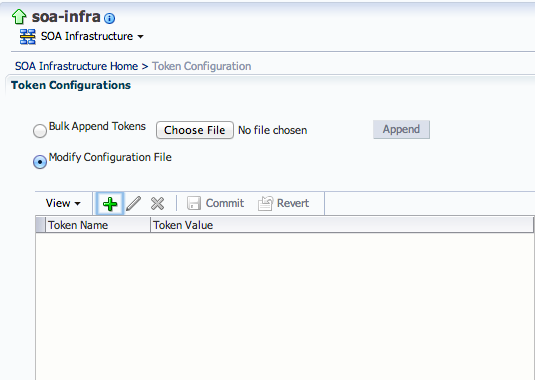 Click on Modify Configuration File and add a new token. Add the LocalSoaServer Token with its value. This will update the mdm-url-resolver.xml file located in the config/fmwconfig folder of the weblogic soa domain. 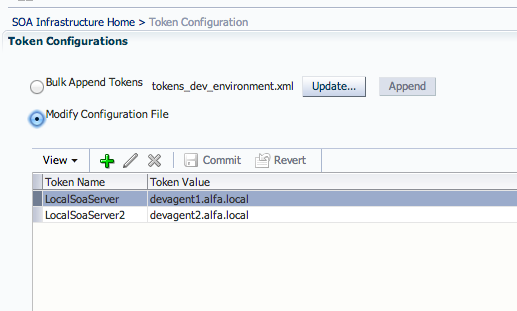 We can also upload the Token file of JDeveloper, this will add the missing tokens. You need to reboot the Soa Server, after this you can deploy the main project and test the main project. here is the demo workspace with all the above code.